Knights of the Order of the Holy Sepulchre accompany Cardinal Foley's casket into the Cathedral Basilica of SS. Peter and Paul before the funeral Mass Dec. 16. Photo by Sarah Webb. 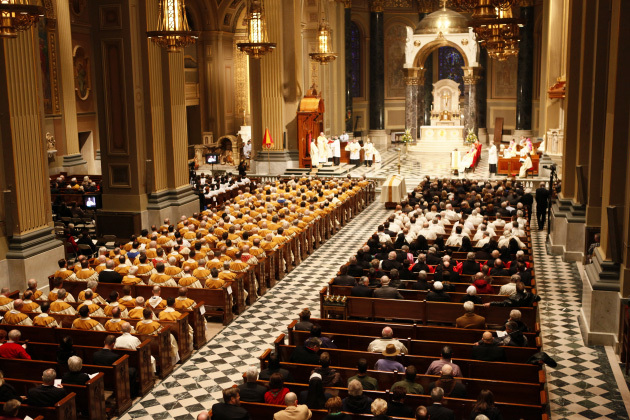 One thing was crystal clear at the Dec. 16 funeral for Cardinal John P. Foley, 76, at Philadelphia’s Cathedral Basilica of SS. Peter and Paul. The man was loved. Technically the thousand or so at the Mass were mourners, but the word just doesn’t seem to fit, because it was basically a happy gathering remembering a happy man. From the cardinals, archbishops and bishops in the sanctuary, down to the hundreds of priests, religious seminarians, friends, coworkers and family in the pews, most knew him from one or more of the various stages of his eventful life. Funeral Mass of Cardinal John Foley, Dec. 16, 2011. Photo by Sarah Webb. As a matter of fact those who had key roles in the liturgy were picked by Cardinal Foley before he died. Archbishop Edwin F. O’Brien, the principal celebrant of the Mass, is Cardinal Foley’s successor as pro-grand master of the Equestrian Order of the Holy Sepulchre of Jerusalem. Archbishop of New York Timothy Dolan, who was the homilist, is also president of the United States Conference of Catholic Bishops. He came to know Cardinal Foley well when then-Msgr. Dolan was rector of the North American College in Rome and then-Archbishop Foley was president of the Pontifical Council for Social Communications. Funeral Mass of Cardinal John Foley, Cathedral Basilica of SS. Peter and Paul in Philadelphia, Dec. 16, 2011. Photo by Kevin Cook for the CS&T. Either concelebrating or present were Cardinal Justin Rigali, Archbishop Emeritus of Philadelphia; Cardinal Sean O’Malley, Archbishop of Boston; Cardinal Daniel DiNardo, Archbishop of Galveston-Houston; Cardinal William Keeler, Archbishop Emeritus of Baltimore, Cardinal Adam Maida, Archbishop Emeritus of Detroit; Cardinal Theodore McCarrick, Archbishop Emeritus of Washington; and Cardinal Donald Wuerl, Archbishop of Washington. 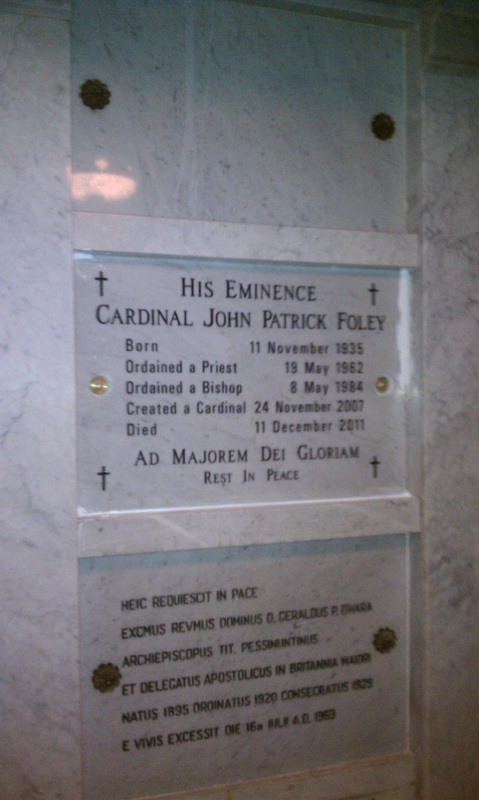 Cardinal John Foley’s final resting place, Dec. 16, 2011. 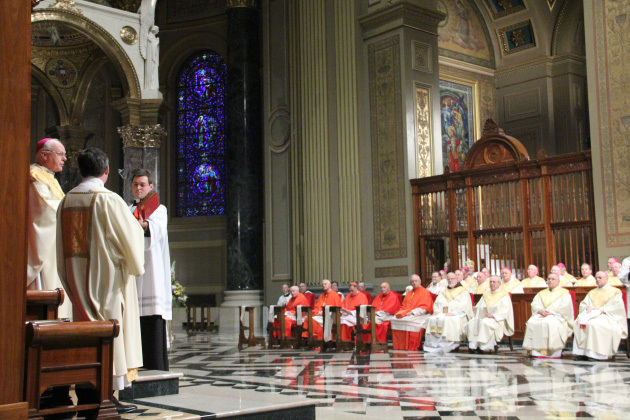 Also present and concelebrating were Archbishop Carlo Maria Vigano, papal nuncio to the United States, who read Pope Benedict XVI’s official letter of condolence, and Archbishop Claudio Maria Celli, who succeeded Cardinal Foley as President of the Pontifical Council for Social Communications. Also present were members of Cardinal Foley’s extended family, including Eileen Guest, a cousin who read the first reading. “I remember us singing (and) talking around the piano,” said Helen Tobin, another cousin who shared his passion for music. She wasn’t surprised when he became a priest, but a bit surprised as he rose in the hierarchy. Now “he might be a saint, who knows?” she speculated. A number of his classmates from St. Joseph’s Prep were also in the congregation, including Charles Kelly and Gus Kueny. Bill Ferguson was a fellow history major at St. Joseph’s College. Many of his seminary classmates and friends in the priesthood participated in the ceremonies, including classmates Msgrs. Francis A. Carbine, Philip H. Cribben and Donald E. Leighton, along with Msgr. Hans Brouwers, who was his assistant when the Cardinal was grand master of the Equestrian Order of the Holy Sepulchre of Jerusalem. The order had dozens of members present at the funeral in full regalia. As a young priest Cardinal Foley was sent to Columbia University for his master’s degree in journalism, and Ron Goldwyn, a former religion writer for the Philadelphia Daily News, was a classmate. A number of others from the world of Catholic journalism were also at the Mass. The late Cardinal was an only child, and was especially solicitous of his widowed mother Regina, who he first took to Rome when he became president of the Pontifical Council for Social Communications. For health reasons he eventually brought her to St. Joseph’s Manor, a nursing facility in Meadowbrook conducted by the Sisters of the Holy Redeemer. Several of the sisters attended the Mass. During his final four years in Rome, he was grand master of the Equestrian Order of the Holy Sepulchre, where he was not only effective in raising funds for the Holy Land, he affected the mission, according to Michael La Civita, vice president for communications at Catholic Near East Welfare Association. His greatest contribution was extending the reach of the order to Lebanon and Egypt, La Civita believes. At the end of the Mass, and after the final committal service conducted by Archbishop Chaput, Cardinal Foley’s casket was taken to the crypt beneath the altar where he was entombed among most of the bishops and other distinguished prelates of Philadelphia. Among the small group of mourners who accompanied the body to the relatively small chamber was Holy Child Sister Gloria Coleman, representing Philadelphia’s interfaith community. As with all the music for the day, the Mass concluded with a hymn selected by Cardinal Foley, in this case “How Great Thou Art,” which probably not by coincidence was also played at the funeral of his own mentor, Cardinal John Krol. A perfect ending.